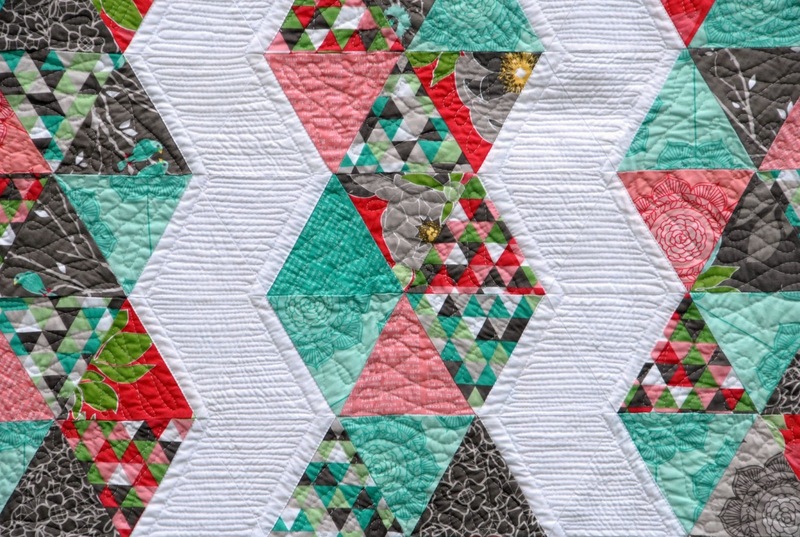 Thank you so much for following along with the 2015 New Quilter Bloggers Blog Hop! Yvonne, Stephanie, Terri Ann, and I really appreciate your support! 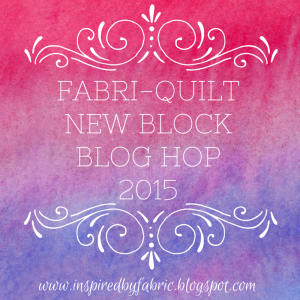 Before I get to the winners of this week's giveaway, I would like to announce that the New Quilt Bloggers have teamed up with Fabri-Quilt and we are excited to bring you the 2015 New Quilt Block Blog Hop at the end of August. The hop will run from Monday, August 31st through Thursday September 3rd. 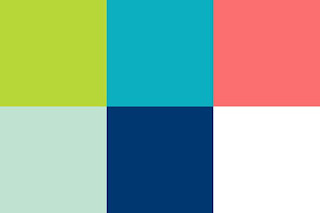 Each of 60 bloggers will be presenting a 12 1/2" x 12 1/2" (unfinished) quilt block with a tutorial to make the block using the following Watermelon Summer Color Palette including Chartreuse, Turquoise, Coral, Aqua, Lapis Blue, and White from Fabri-Quilt. 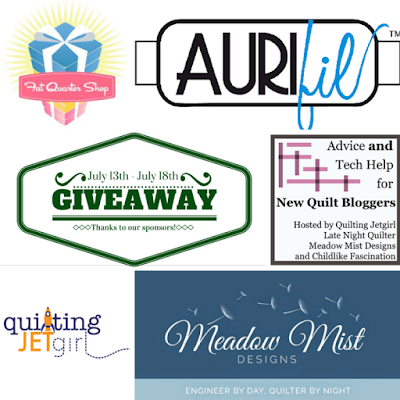 Thanks again to our generous Week 4 sponsors of the 2015 New Quilt Bloggers Blog Hop: Aurifil, The Fat Quarter Shop,Meadow Mist Designs, and Quilting Jetgirl. Below is a recap of all the wonderful posts from Week 4. 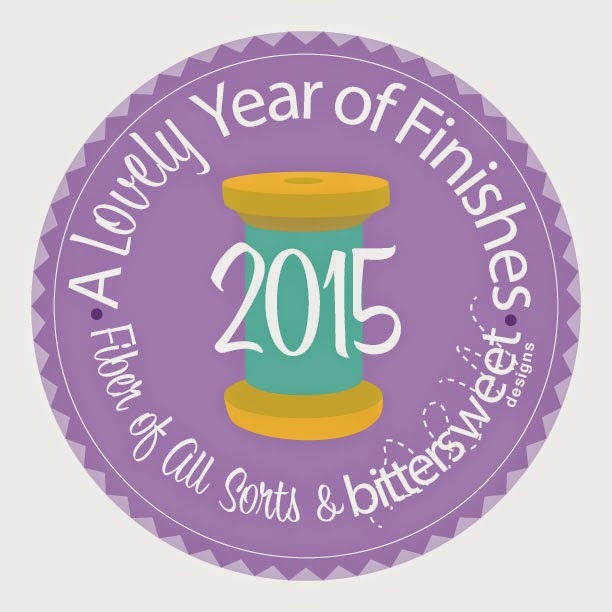 I am excited that today I have a finish to share with you! 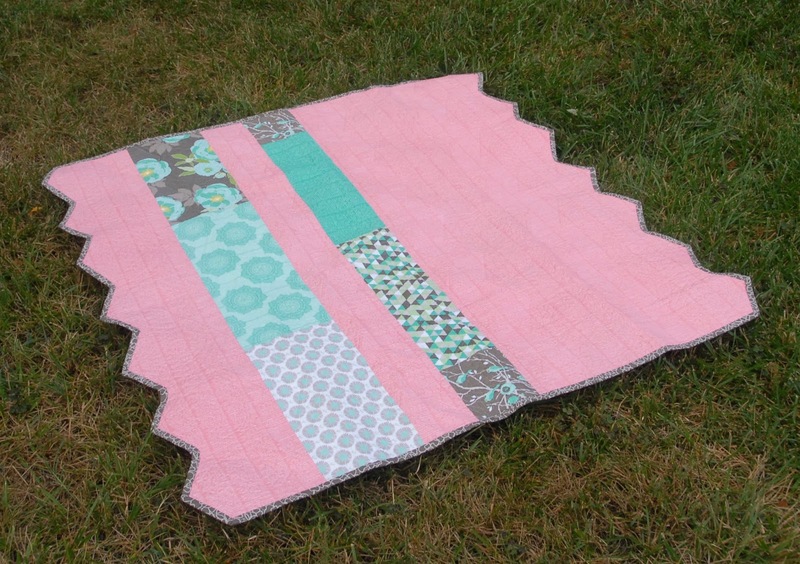 Here is my finish (just in time) for the Riley Blake Challenge from the Modern Quilt Guild. 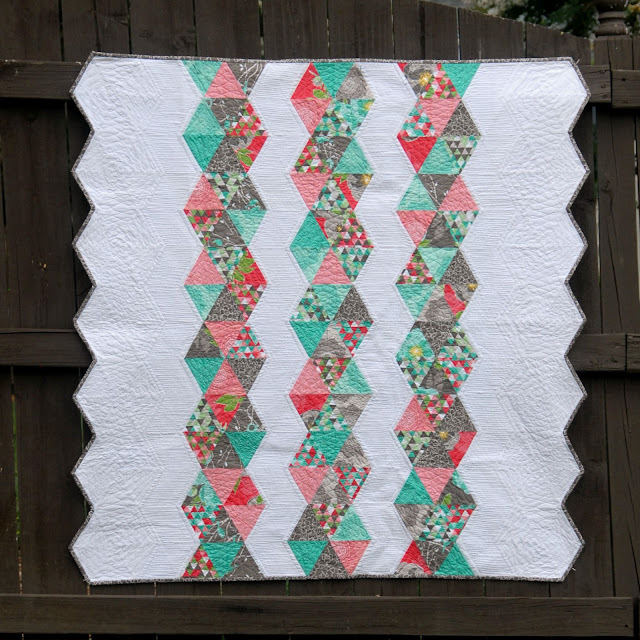 An equilateral triangle quilt has been on my to-do list forever and after I saw that some of the fabrics had a repeating triangle print, I was sold. In addition to making a triangle quilt for the first time, this was also the first time I had ever bound a quilt without 90 degree corners. I knew that for the quilting in the background areas, I wanted to echo the hexagon shape formed by the print fabrics and then fill in the remaining space with a dense back and forth quilting. I also wanted to mimic the quilting from the print areas in some of the background triangles. Figuring out the quilting for the print areas was more difficult. I first started to quilt a star pattern within the print triangles but the quilting was difficult to see and not dense enough compared to the background. I put out a call for help on Instagram (@MeadowMistDesigns) and got some wonderful suggestions. I wound up using a ribbon candy design that not only looked good, but took much less time and had less threads to bury than my original plan. I used Lorna's @ Sew Fresh Quilts tutorial on binding inside corners to figure out how to bind the quilt and while it is far from perfect, it turned out pretty decent. The quilt finished at about 48" x 48", a perfect size for a new baby. I have a new niece or nephew due this December and if the baby is a girl, I will be sending this quilt off to her. Here are just some more pictures, including the pieced back, to celebrate the quilt's finish. Midnight Mystery Quilt - More Sponsors! I would like to introduce you to the two new sponsors of the Midnight Mystery Quilt. Busy Hands Quilts is a blog and Etsy shop run by Myra (who is hosting her own Gravity QAL). 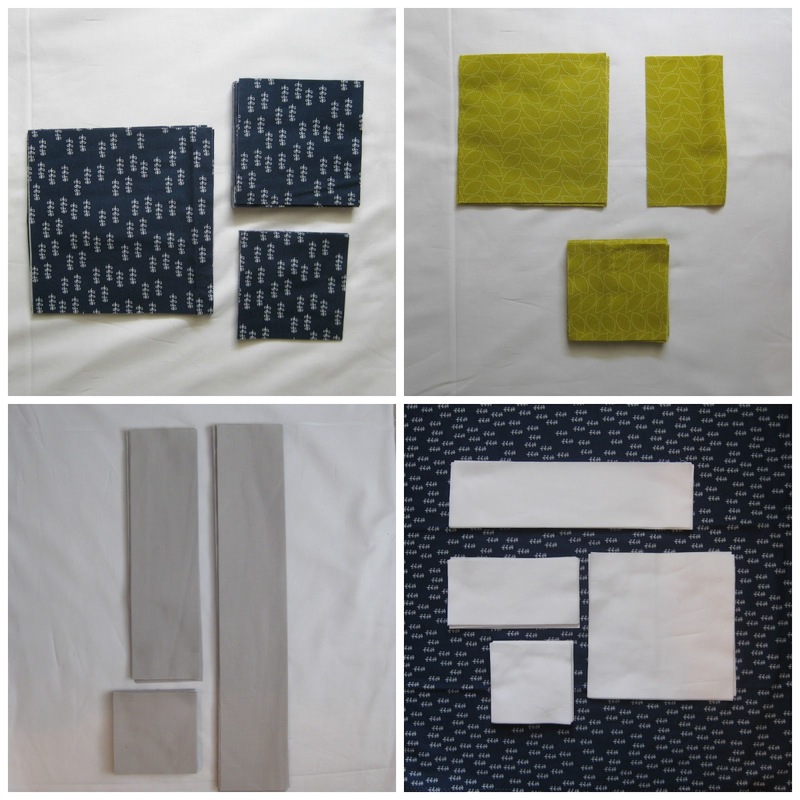 Myra is taking part in the Midnight Mystery Quilt and has some wonderful fabrics selected. She has graciously donated 2 copies of her new quilt pattern Picket Fence as prizes for the reveal of the Mystery Quilt. Karen is a wonderful quilter in my local quilt guild who also works for Blank Quilt Corporation / Studio e and worked to bring us more giveaways. 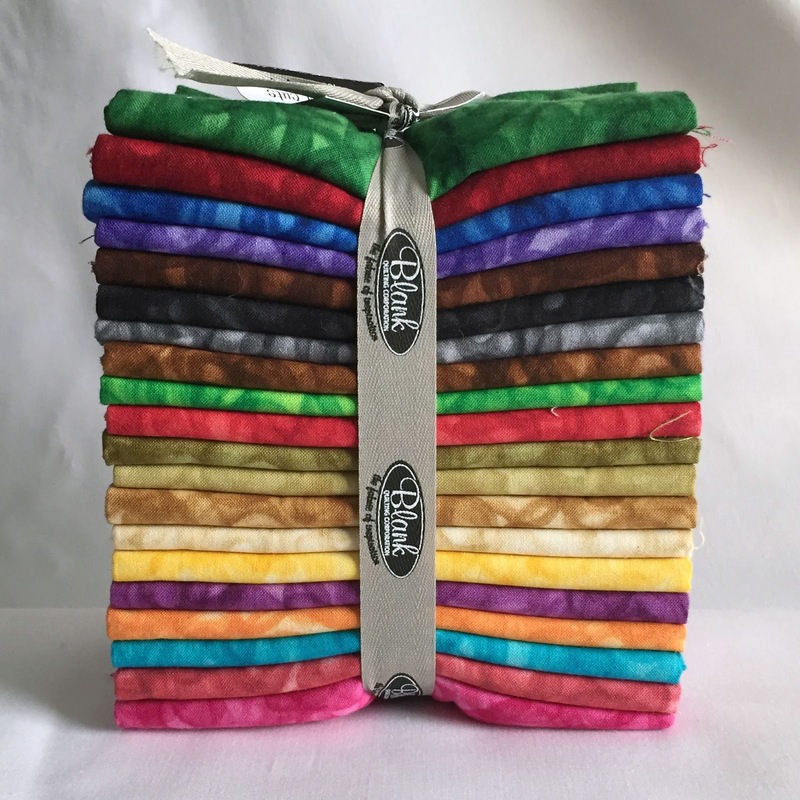 Blank Quilt Corporation / Studio e have donated some wonderful fabric bundles as prizes. (It is going to be so hard to keep these in my sewing room until March and not use them!) 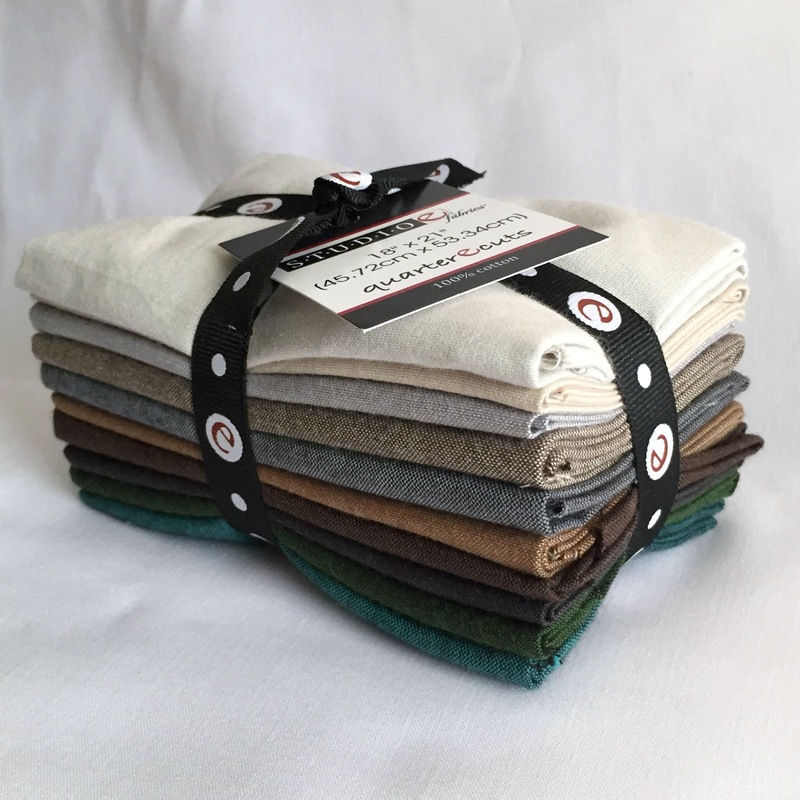 Up for grabs is a Studio e Fabrics 10-pc fat quarter bundle of Peppered Cottons and Blank’s 20-piece fat quarter bundle called Fusion Illusion. This new sponsors are in addition to our other wonderful sponsors: Pile O'Fabric, Bear Creek Quilting Company, and the Fat Quarter Shop. We have 4 hosts, Yvonne @ Quilting Jetgirl, Stephanie @Late Night Quilter, Terri Anne @Childlike Fascination, and myself, each posting about several new bloggers for you to check out every Monday over the course of 4 weeks. You can click on their links to visit their highlighted bloggers this week. Thank you so much to everyone who contributed to our Advice Post series! Giveaway will run through July 25th 11:59 pm EST and is open to entrants 18 years or older. Winners will be announced July 26th. I am happy to announce the winners from the Week 3 giveaways for the 2015 New Quilt Bloggers Blog Hop. Thanks again to our generous Week 2 sponsors of the 2015 New Quilt Bloggers Blog Hop: Aurifil, The Fat Quarter Shop, Meadow Mist Designs, and Quilting Jetgirl. 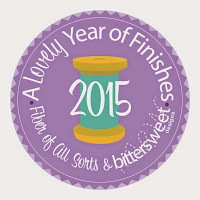 (1) Kate Spain Aurifil Thread Collection from Aurifil: Sherry B. (1) $50 Gift Certificate from The Fat Quarter Shop: Janie M.
(2) Patterns of your choice from Meadow Mist Designs: Carol Y. 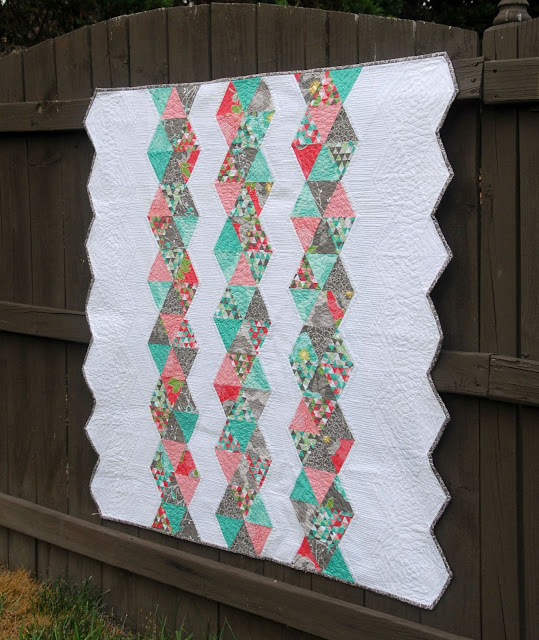 (2) Patterns of your choice from Quilting Jetgirl: Valerie P.
Below is a recap of all the wonderful posts from Week 3. Please take some time to visit this week's bloggers if you have not had a chance to do so yet. Giveaway will run through June 18th 11:59 pm EST and is open to entrants 18 years or older. Winners will be announced July 19th. July's assignment for the Midnight Mystery quilt-a-long was to cut all of your fabrics. Here are my cut pieces all ready for piecing. In August (the 6th) we will start piecing the blocks :) Thanks so much for quilting along with me. Welcome to the second month of instructions for the Midnight Mystery Quilt! The first set of instructions posted in June were on fabric selection (link in the Mystery Quilts tab above). 1. Is it too late to join? - I have been asked a few time whether it is too late to join in. It is definitely not too late! All we have done so far is select fabric so you can very easily catch up. 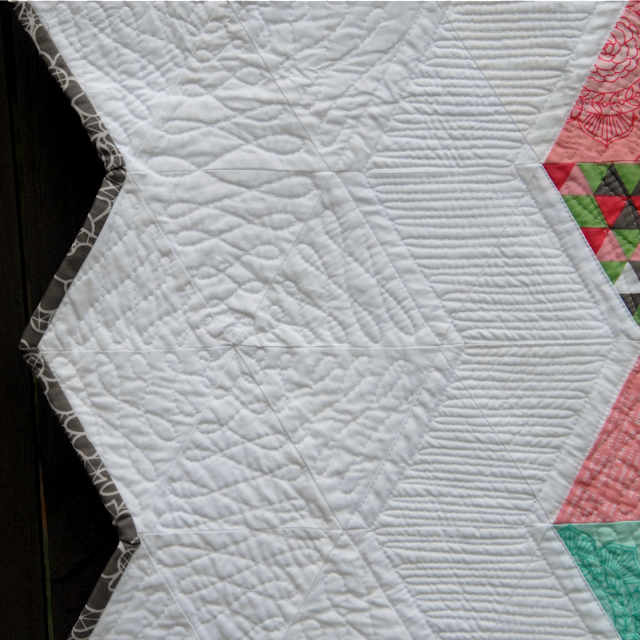 Also, the instructions for the mystery quilt will always be available on the blog (see Mystery Quilts tab above) so you can start at any time. 4. New Sponsor - I am so excited to announce that the Midnight Mystery quilt-a-long just got its fourth sponsor, The Fat Quarter Shop, who is generously giving away a $100 gift certificate! A few more quilt-a-long announcements can be found at the bottom of the post... and now are you ready to start cutting into your fabrics? The cutting instructions contain both a listing of pieces by size for cutting from multiple fabrics and cutting instructions for each set using a single fabric. Please note that if using the cutting instructions for a single fabric, in some cases a few extra pieces will be cut than needed in the pattern. a. Cut 1 strip into 6 squares (6 ½” x 6 ½”). b. Cut 1 strip into 2 squares (6 ½” x 6 ½”) and 2 rectangles (6 ½” x 3 ½”). a. Cut each strip into 4” x 4” squares (10 per strip) for a total of 36 squares (4” x 4”). a. Cut each strip into 7” x 7” squares (5 per strip) for a total of 9 squares (7” x 7”). a. Cut 4 strips each into 4 ¾” x 4 ¾” squares (8 per strip) for 32 squares (4 ¾” x 4 ¾”). b. Cut 1 strip into 2 additional squares (4 ¾” x 4 ¾”) squares and use the remainder of the strip to cut 4 squares (4” x 4”). a. Cut each strip into 7 ¼” x 7 ¼” squares (5 per strip) for a total of 9 squares (7 ¼” x 7 ¼”). a. Cut each strip into 2 rectangles (13” x 3 ½”) and 2 rectangles (7” x 3 ½”) for a total of 18 rectangles (13”x 3 ½”) and 18 rectangles (7” x 3 ½”) . a. Cut each strip into 4” x 4” squares (10 per strip) for a total of 38 squares (4” x 4”). a. Cut 9 strips each into 2 rectangles (19” x 3 ½”) for a total of 18 rectangles (19”x 3 ½”). b. Cut 6 strips each into 3 rectangles (13” x 3 ½”) for a total of 18 rectangles (13”x 3 ½”). 1. Prizes - We will have a bunch of prizes for the quilt reveal in March 2016 (these will be randomly given away). The sponsors of the Midnight Mystery Quilt are The Bear Creek Quilting Company, Pile O'Fabric, The Fat Quarter Shop, and Meadow Mist Designs. Details on what each are giving away can be found in the sponsors post here. 2. Quilt Kits - Pile O'Fabric (one of the quilt-a-long's sponsors) originally offered two Midnight Mystery Quilt Kits (in a 1st colorway and a 2nd colorway) and both colorways sold out in less than one week! 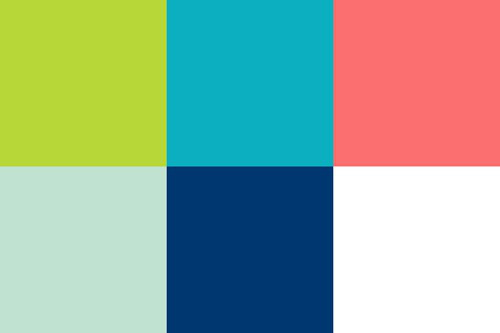 I have worked with Alyssa and we have created a 3rd, 4th, and 5th colorway which are now available. 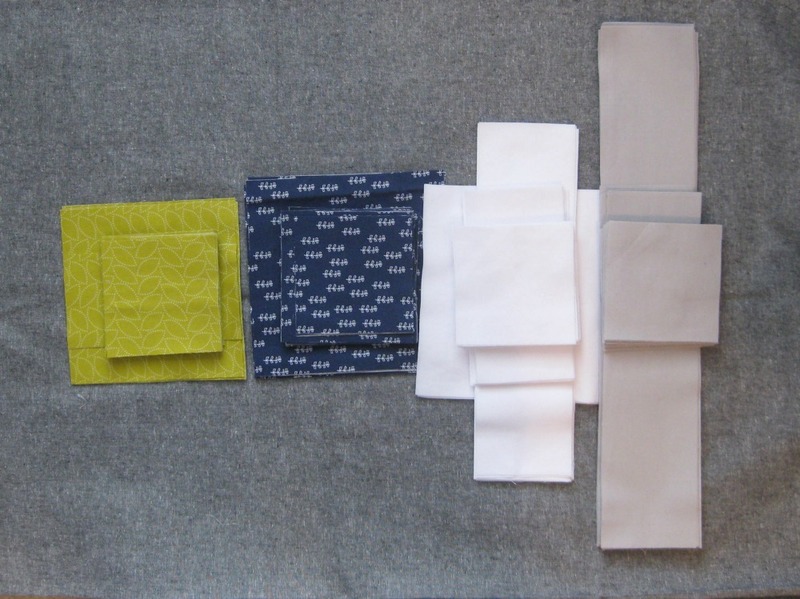 The kits include all of the fabrics needed (6 ⅞ yards total) to make the quilt top and the binding (backing not included). Each of the kits are $52 with free shipping within the domestic US.